Oh boy! Before the trip, I got quite nervous picturing myself wearing nothing and having a dip in a hot spring pool. The worst part is the pool is shared with other men. However, I told my conservative self there was nothing to shy about. And furthermore, it was a golden opportunity for me to let go of my attachment to my body (as the Buddha said everything is impermanent) and it was also a great time to learn that how people think about you did not matter at all. I know it sounds like a self development talk but trust me, if you feel nothing when you bare all in front of others, you have learned one of the greatest lessons in life about empowerment. It is liberating. 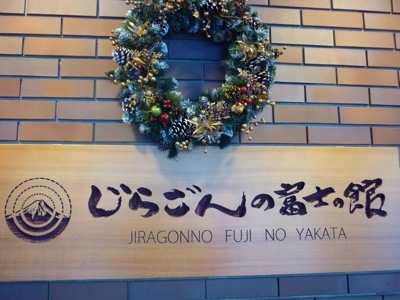 Onsen is very common in Japan and it is one of the family activities Japanese like to do. It is not uncommon that the kids in the family have seen their parents naked during onsen sessions. The water is channeled to the pool directly from the ground. And it is proven that hot spring water contains minerals beneficial to human body. Besides, just like spa, it has relaxing and rejuvenating effects on the users. The normal temperature in a hot spring pool is about 40˚C. I knew nothing about Japanese hot spring baths as this was my first experience. However, the tour guide had done a very good job explaining what we should do when we went for onsen, and encouraging a bunch of conservative Asian tourists to try out Japan’s famous hot spring baths. After checking in Jiragonno Fuji-no-Yakata Hotel in Yamanashi (it is located in a forest or something like that), my wife and I headed to the bath before dinner – with a kimono and jacket. Thank god it was not packed then, about 4 men were there. I hoped not to meet anyone I knew but three of them were my tour members! Remove all your clothes and keep in the basket provided. You can bring a face towel to the pool. Its purpose is to wipe your body, face, or head. If you feel tired (which is normal), get out of the pool and walk around. Take another dip if you prefer. When you are done, take a bath and get dressed. But a Japanese friend told us not to take shower right after the hot spring bath. It is to let the minerals from the hot spring to be absorbed by the body. I am not sure about that but I prefer to clean up after the dip. CAUTION: After meal, you must not enter the pool until 30 minutes later. After bath, we had dinner and it was the first time we had ice-cream during our trip. On that note, even though it was winter, Japanese love cold drinks. Restaurants even serve iced water during breakfast in winter! Do I like onsen? To make full use of our Japan trip, my wife and I made a second trip to the pool in the next morning before breakfast. One more thing, I have overcome the hesitation to get naked in front of others during onsen. It is now not something I have second thoughts about.